Aiming at maximum level of client-satisfaction, we are offering the Flute Laminator Machine which is manufactured strictly as per the specifications of our clients. These machines are highly reliable for longer service life and gives and excellent performance. We tested these machines with the help of our diligent quality auditors in order to ensure their flawlessness and greater operational efficiency. Localization bottom never goes beyond, suitable for laminating the paperboard together and for laminating the paperboard with the A/B/C/D/E corrugated cardboard together. 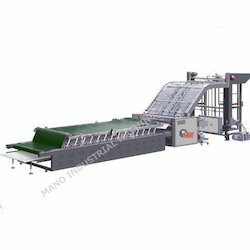 Bottom paper and face paper can fore-and-art adjustment, easy to laminate Feeding glue system are automatically controlled by the liquid relay, the thickness of glue can adjust. Gluing uniformity, lower glue cost. Control panel, electromagnetism clutch without touch point relay, the position is monitored by the photoelectric switch, digital automatic counter. The whole structure is compact, with beautiful appearances and high work efficiency. Cycle stacking planes could stack the next batch paper well in a state of non-stop working , more efficient. 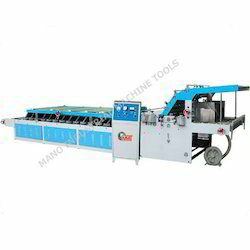 Bottom sheet use suction auto feeding, automatic tracking according to the face paper's speed. New concept front gauge location, position high accuracy, bottom sheet never pull ahead. Machine uses touch-screen/PLC/servo motor control system, circuit system is stable and could display the failure alarm automatically. Automatic gluing and the glue can be used circulatory, avoid glue waste. Roller design scientifically, avoid glue fly out when the speed is high. Pressure rollers adopt one side adjustment, convenient and fast. Rocker controls wash roller's fluctuation, easy cleaning. Counter designs scientifically, easy recording the amount you have been worked.